This Accurate Platelet Agitator Model No. ASPA is specifically designed to maintain donor platelets an even suspension throughout the blood plasma. 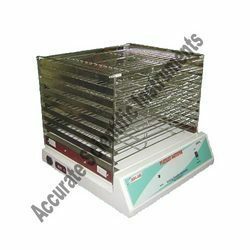 This Compact Accurate Platelets Agitator Model ASPA – 10/11/12 is specifically designed to maintain donor platelets an even suspension throughout the blood plasma. Platelet Agitator agitates at the fixed speed of 70 to 80 strokes per minute. The self are pure in stainless steel (SS-304). Looking for Accurate Platelet Agitator ?